It's true. I'm in love....with the new Stampin' Up Trimmer!! I think that finally after many, many, many years of searching for a trimmer that I'd love, I have finally found it!! There are so many features that make this trimmer stand out-- a wider base so it's easier to cut those standard 5 1/2 x 4 1/4 cards, places on the trimmer to keep the blade and scoring blade that don't interfere with cutting, a swing arm that goes to 15 1/2 inches and has a stabilizer leg, the numbers/grid are under a protective coating so they won't wear off and so on. I have tried so many trimmers over the years and really, honestly can say this is the first one that I've truly felt did the best job! You can buy the trimmer from my online site HERE and there is also a video on there that shows and explains all the awesome features as well. The refill blades will be coming out very soon for this trimmer as well. The blades are estimated to last for about 500 cuts each way--I use mine A LOT and really haven't had the fraying happen yet that happens on other track blade trimmers I've tried. I also like having the scoring blade on the trimmer all the time as well because now I cut my card base and score it all at the same time! Have a fabulous day and I'll see you back here soon!! 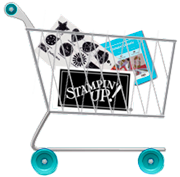 Remember you can purchase all your stamping and crafting needs at my Stampin' Up website anytime~ Click HERE to go shopping!! I will have to keep this in mind... 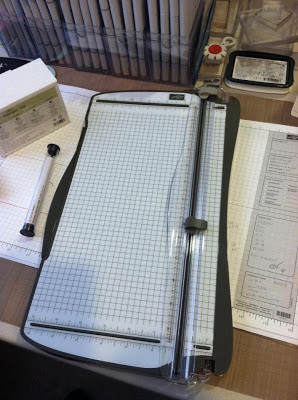 I go through paper-cutter often. looks like a great product! 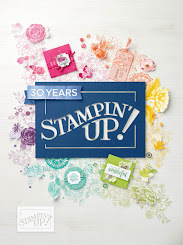 i haven't ordered anything from stampin up in a while. i've had something on my wish list for a long time so i just placed an order through you!